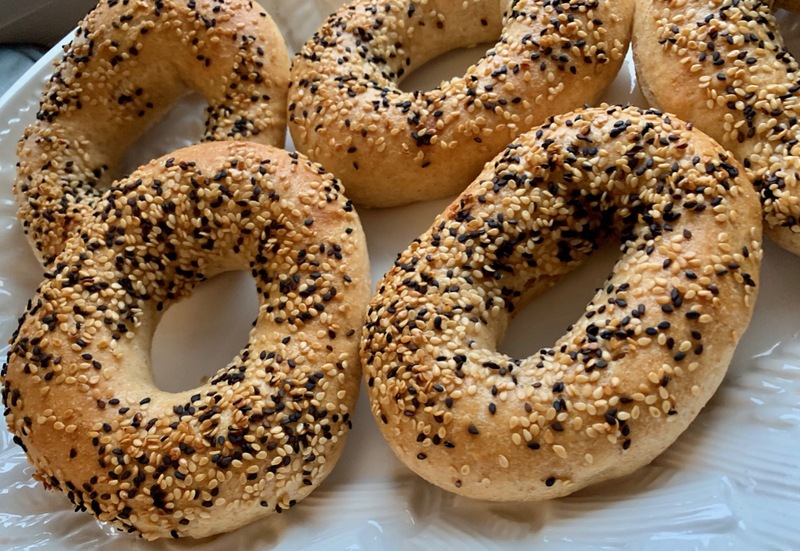 If you live in New York like me you are spoiled as there is little doubt we have more bagel shops than anywhere in the country and most of them are very good. 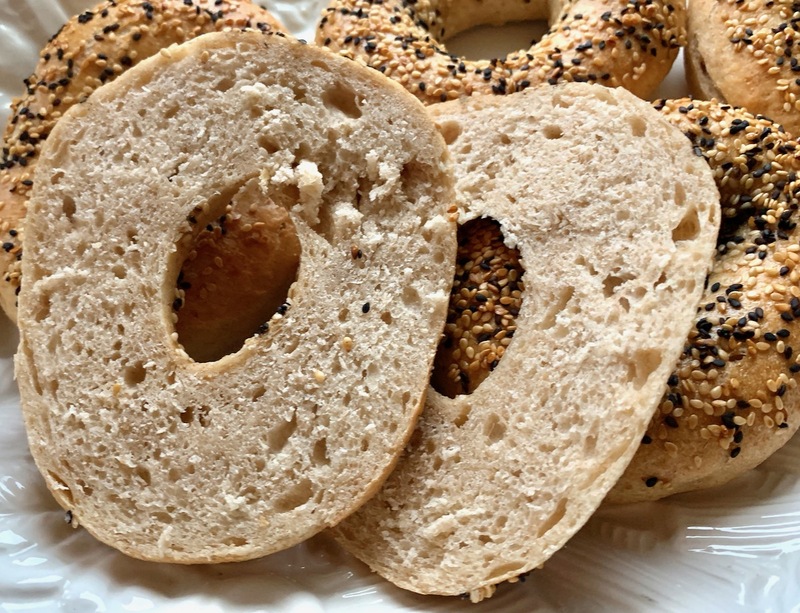 I have tried bagels in other cities and usually they taste like a dense tasteless ball of dough. Since I usually can get great bagels in my town I usually don’t make them myself but I figured I would give it a go with a twist of course. I decided to use my apple/blueberry yeast water to make a durum and high gluten flour starter. 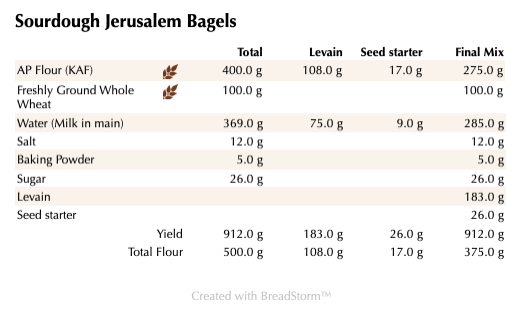 I built this as usual in 2 steps as outlined below and I used King Arthur’s Sir Lancelot high gluten flour along with some more durum flour in the final dough. To shape the bagels I used the technique outlined in the excellent book “Inside the Jewish Bakery” which instructs you to form the dough into ropes and after cutting off the correct size piece to adjoin the rope together and roll out to seal. I must admit I need more practice with this technique as some of my bagels ended up looking like a blind man-made them. 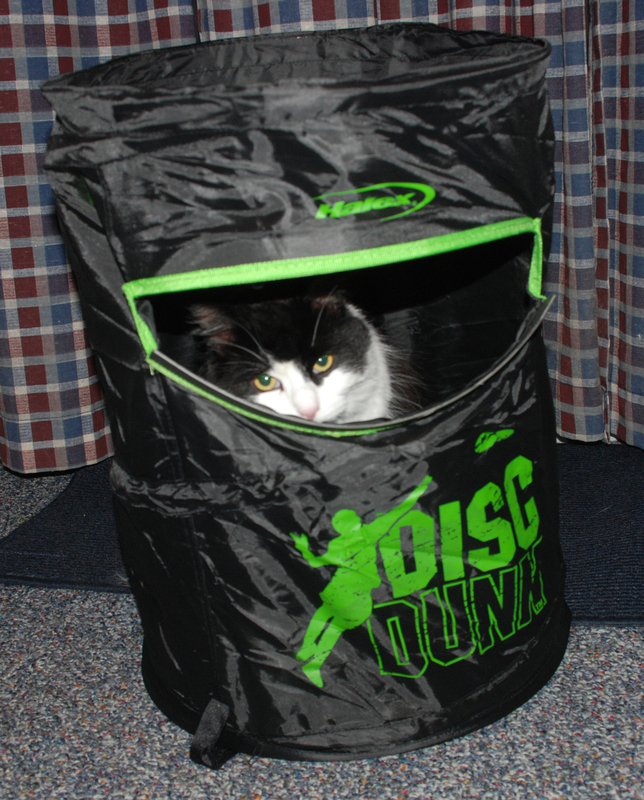 The end result was satisfactory. The durum combined with the yeast water provided a nice slightly nutty flavor with a nice moist crumb. I don’t think I’m ready to open up my own bagel shop yet, but overall they made a nice toasted bagel with cream cheese. 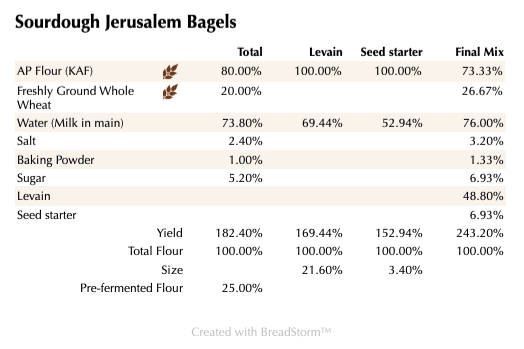 Mix the levain with the water to break it up in your mixer or by hand. Next mix the rest of the ingredients in your mixer or by hand for 2 minutes on speed #1. Change to speed #2 for 4 minutes and then place on your work surface and knead by hand for about 2 minutes. You should not have to add any flour as the dough should be tacky but pretty stiff and easy to knead. Place the dough in a lightly oiled bowl and cover it. Let it rest in the bowl for 3 hours. After 3 hours turn the dough out onto your unfloured work surface and form the dough into a log shape. Cut it into 2 pieces and roll each piece into a 2″ diameter rope. Let it rest covered for about 20 minutes to relax the dough. Roll one of the ends of the rope into a strand about 8 to 10 inches long and wrap it around your knuckles and break it off with your thumbnail or a bench scraper. 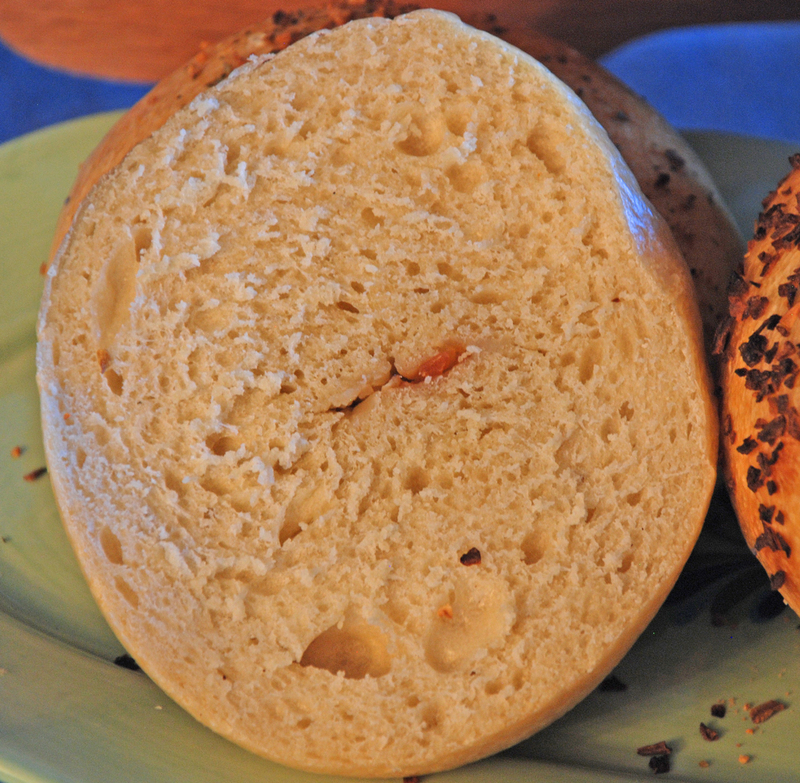 Roll the overlapping ends against your work surface to seal the bagel. You may need to spray some water on the surface to help roll and seal the bagels. Place the bagels on a parchment lined baking sheet and cover with oil sprayed plastic wrap. 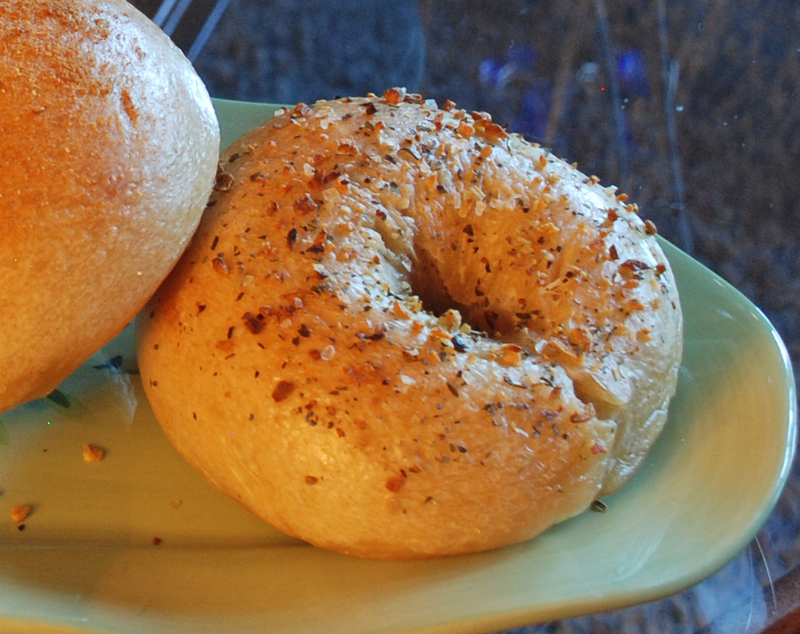 Place the bagels in your refrigerator overnight to develop the maximum flavor. The next morning heat your oven to 460 degrees F. while at the same time prepare a large pot of water and bring to a rolling boil. Add another 25 grams of malt syrup to the boiling water (note this is not listed in the total ingredients). 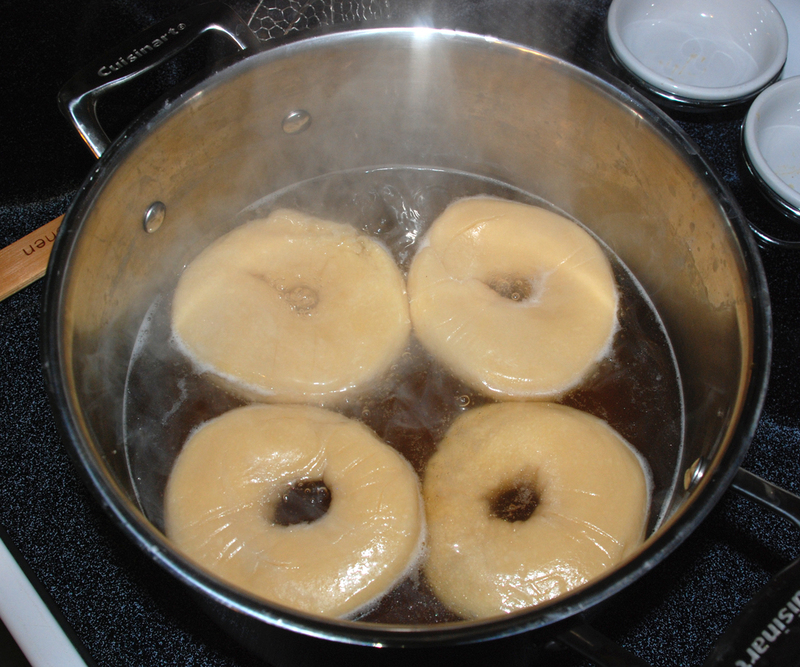 Next add 2-3 bagels at a time in the boiling water and remove them once they start to float. 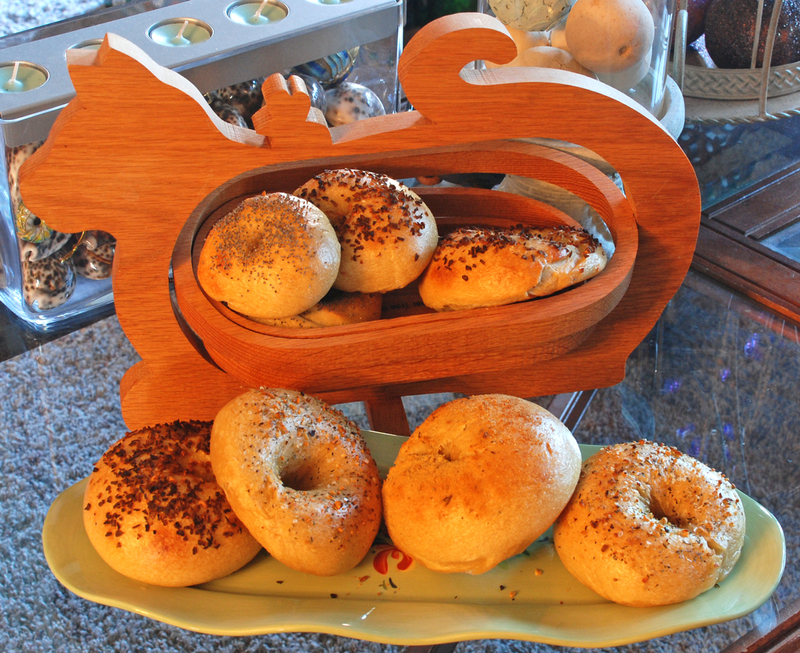 Place the bagels on a cooling rack and immediately add your toppings of choice. I used toasted onions, poppy seeds, toasted garlic mix and parmesan cheese mix. 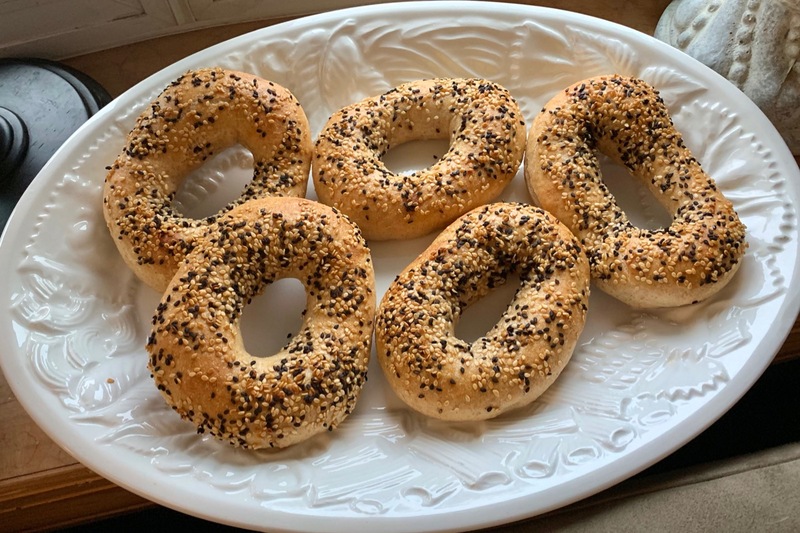 Once the oven has come up to temperature, place the bagels on your baking sheet again and bake for 15 to 20 minutes until they are nice a brown. Remove them from the oven when done and let cool on a rack for about 20 minutes or longer before diving in.